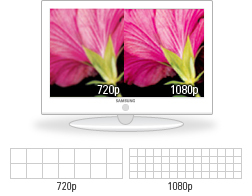 Samsung's 550 Series is a perfect way to step up to Full HD 1080presolution. A fast 5 ms response rate produces smooth-motion scenes for sports and action movies, and a dynamic contrast ratio of 30,000:1 makes for deep blacks and crisp lines (15,000:1 in 32-inch and 37-inch models). Superb connectivity and networking with a USB port and 3 HDMI 1.3 ports with Consumer Electronics Control (CEC) means these HDTVs play well with all of your other electronics. Easily enjoy MPEG and JPEG files stored on external devices by connecting through the side-mounted USB 2.0, turn your LCD into a full-scale home viewing gallery, or connect your MP3 player for a dynamic audio experience. V-Chip system allows blocking of rated TV and movie programs determined by the parent to contain objectionable content. Variable sleep timer to turn the TV off in varying time intervals. Auto wall mount compatible: 3-dimensional operation via TV&rsquo;s remote control; no external IR receiver required. 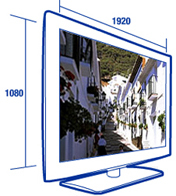 Full HD, or 1080p, contains 1.5 times more scanning lines than conventional HD TVs. More scanning lines mean more pixels, more details and a better picture. The new Samsung LCD TV with resolution that is approximately 2 times greater than conventional HDTVs, creating the most perfect picture imaginable. Samsung&rsquo;s 1080p panel uses a new high-speed liquid crystal to cut response time to 4ms. The fast response time, coupled with Samsung&rsquo;s Auto Motion Plus 120Hz motion blur reduction technology dramatically reduces motion blur and judder. 30,000:1 Dynamic Contrast Ratio will give you a picture better than you ever thought possible, with whiter whites, blacker blacks and a nearly infinite subtlety of gradations in between. As two of the most important determining factors in overall picture quality, contrast and brightness levels achieve new heights in this latest generation LCD panel. Samsung&rsquo;s new LCD TV&rsquo;s give the most stunning realistic picture quality ever. 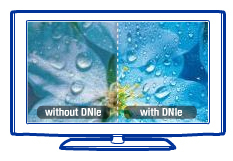 DNIe The Samsung Digital Natural Image engine. This exclusive Samsung technology dramatically improves the picture by enhancing the contrast, detail, white balance and reduces. 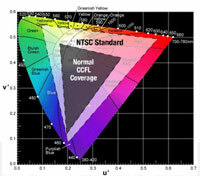 The NTSC (National Television Systems Committee) has established the color standards all TVs in America try to meet. 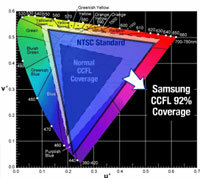 And typical LCD TVs only meet about 72% of this standard. 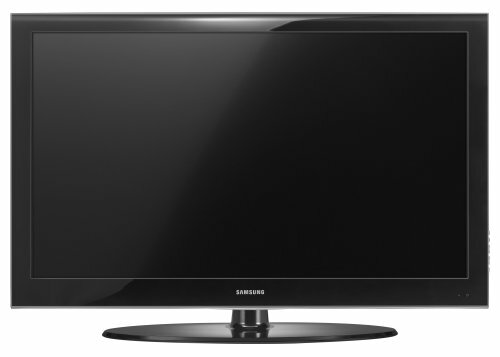 Samsung LCD HDTVs use Cold Cathode Fluorescent Lamp back lights to give you 92% coverage of the NTSC standard, ensuring truer, more breathlessly vivid colors. 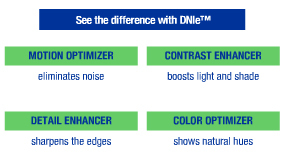 Samsung&rsquo;s exclusive Wide Color Enhancer technology delivers more brilliant colors, even in bright areas of the picture where blues and greens are washed out on conventional screens. The system displays wider color reproduction, showing you truer colors &ndash; the fresh green of spring foliage, the intense blue of the summer sky. To make the Series 6 a true entertainment hub for any home, Samsung has incorporated advanced HD connectivity and networking capabilities that expand the HDTV&rsquo;s functionality. A wide variety of multimedia devices can be connected to the set through any one of the four Simplay compliant HDMI 1.3 inputs (including one on the side), and the handy HDMI-CEC feature lets you control all your CEC-enabled peripherals using just one remote. Connect HD digital devices like disc players, game consoles, and satellite dish components into the 2 rear connections and use the side-mounted input for cameras, camcorders, and laptops. HDMI is the best performing interface for displaying an HD source on an HDTV. Once connected, users can easily access device menus and manage and display content through the newly redesigned Wheel Key Remote control and the HDTV&rsquo;s sophisticated content management interface. TruSurround is a patented SRS technology that solves the problem of playing 5.1 multichannel content over two speakers. TruSurround delivers a compelling, virtual surround sound experience through any two-speaker playback system, including internal television speakers and headphones. It is fully compatible with all multichannel formats up to 5.1 channels. High-quality virtual surround sound can be experienced with just the two hidden, downward-firing side-mounted 2.2-channel dome speakers built into the TV. SRS TruSurround XT technology delivers an amazing, simulated 3D effect with clear dialog and powerful bass. TruSurround XT audio also adds three audio enhancement technologies to produce an amazingly immersive sound experience. Dialog Clarity brings movie dialog into Focus during the playback of any surround-encoded material to make speech much clearer and crisper. TruBass creates incredible deep rich bass allowing a person to perceive significantly deeper, richer low bass tones that are far beyond the physical low frequency capabilities of the speaker itself. The SRS WOW feature widens the sound stage by processing standard two-channel stereo material as well as multi-channel encoded material for a dramatic improvement in the playback of any stereo audio over a two-speaker system. Stereo broadcast reception is offered for MTS and SAP with 181-channel capacity. A sound leveler keeps audio volume consistent during channel changing. I have had the LN52A550 for almost a month now and am very pleased with it. It is my first LCD TV and spent several weeks researching different brands prior to purchasing through Amazon. Amazon had the best price. The matte screen works well in my great room which has three walls of windows/doors. Very little problem with glare. Picture quality is great. Sound quality although downgraded on a lot of reviews is what I would expect from a TV. Never thought any TV would put out great sound without a home theater system. CEVA was the delivery company and did a good job. Scheduled delivery, was on time and did all I asked to check the TV before leaving. I threw it off my 8th floor balcony and it still works!!! Since ordering my Samsung, I have nothing but good things to say about it. The resolution is awesome, the setup was very easy. The whole purchase experience was not difficult at all and the price was amzazing. I purchased this television in February of 2008 after doing weeks of research and comparing the picture quality to other HDTVs in store. I could not be happier with this television. I have had it for over a year and it has survived two moves, and a toddler spilling a drink down the front of the LCD screen. Once you view an action movie or a sports game on this Samsung, you will never be able to stand watching it on a lesser quality television. If you are a serious gamer, you will fall in love with the resolution, clarity and smooth motion. - Initially I was a little disappointed because when you don't have HD, the image does seem a little pixelated. However, use the Samsung software option in their menus and enable the automatic smoothing, and you'll see quite an improvement. - I hooked up the TV to the computer and it works great. A PC resolution of 1280x800 is sufficient. It's easy to browse the net, watch videos, checks email and type out documents on the TV, it's great. I do recommend a wireless keyboard and mouse with this setup. - If your PC doesn't support PCI-X (PCI Extreme) video cards (which are the cards that handle HDMI output -- and that is desirable because one HDMI cable can carry both video and sound), then you need to hook up 2 cables, one for video (get a long VGA cable) and one for sound (standard 3.5mm RC jack), and connect the 2 cables from the PC to the TV. - Lots of people complain about the sound not being amazing, but you really don't notice any mediocricy if you hook up the TV to a surround sound system. Problem solved. All in all, for me this TV was a really worthwhile investment. I had been looking at both this model and the LN52A650. Before purchasing either of these, make sure you take a look at it in the store. Most of the time the settings on the TV in the store are not adjusted optimally, but even still, it should give you a good idea of what it will look like when you get it home. In my case, looking at identical images on both this and the 650, i could not tell the difference. I do occasionally notice slight jaggedness on the edges of fast moving images, but generally this is ONLY when i am closer than 5 feet to the screen. As with any HD set, if you are watching Standard Def tv it will be quite pixelated. Great TV - husband loves it! Between the recession and the introduction of the 240Hz LCD TV's, the price for this big beauty is down nicely. We watch movies, Hi-Def cable shows and kid shows in my family, mostly, and this TV does a fantastic job with each. If your focus isn't on sports, this is an excellent television and a very good deal right now. If you haven't bought a TV in a few years, or this is a step up, be warned! there are a lot of options and features to work with. It is worth your time to learn them, but it does take a little time. If you routinely upgrade your computers or cell phone every couple years, you'll be fine. If you don't, be prepared to spend some time learning what this beast of a TV can do for you. This tv has an outstanding picture!All functions were easy to operate. Setting up the picture quality was a lot easier than I was led to believe. The only knock I have against this tv is the sound system.Very mediocre. I was looking for 52" SAMSUNG for about 6months. I was considering the LN46A630 as it had 120hz but the screen size was small and 120hz was waste of money in my humble opinion. So I finally decided on this TV. At the time of purchase, the price at amazon.com was the best price I have a seen from reputable seller plus the $200 GC from Samsung made it even sweeter. The delivery was thru CEVA and I was a bit worried. The delivery guys were professional. They unpacked the TV attached the stand and set it up on floor as I did not have my TV stand ready at the time. They made sure the TV was working before they left. I also noticed that their truck was half full of all kinds of HDTV's so they must be experienced doing this stuff. It is heavier for a single person to handle carefully. The picture was amazing. The factory settings are OK to get started but try changing the settings and you will get the picture that you like in a few minutes. For the picture brightness, you can change the brightness settings OR change the Power Saving Mode to HIGH setting this will reduce the brightness of the picture and also reduce the power consumption. These is a lot information on calibration settings in the internet for this TV that will give you an idea to get started but there is not much to calibrate as some nerd squads make you think. I am watching this TV at a distance of 10 feet and it is perfect. I have not tried Bluray but the standard OTA signals in 720p and 1080i look amazing. 480 signals look OK but this TV is not built for 480 signals. I am happy with the 60hz. I was into getting a 120hz but after watching the difference between them at a local store, I decided that is is not worth the additional $$$. I would spend the additional money on getting a nice Bluray player. I personally feel that 120hz is more of a hype created by the manufacturers. The sound is OK to get started but I hooked up my Home Theater after a few mins of setting up the TV. It does not do justice to use this TV without a home theater system. I wish Samsung just not include the speakers and give us a price break for the speaker costs. This TV is fantastic. Colors are sharp, has all the ports you need, and bunch of settings to tweak. And it's Samsung so quality wise you know you can't go wrong. The only issue with the TV, which many people have complained about is the sound. Follow the sound settings from this site, http://www.avsforum.com/avs-vb/showthread.php?t=1020612 and those sounds settings are gone. Nothing else to say about the TV itself as it's perfect. I've owned this tv for a few weeks and i have to say i am very happy with it. The picture with Xbox 360, Playstation and blu-ray is fabulous. Also a plus is that you hardly get any glare from windows or lights in the screen. Only downside I have really seen is that the speakers in the tv don't have good sound. Though this isn't really a problem considering i don't use them anyways. And the price for the Tv was the cheapest high quality television i could find. So far I have no problems with this television. It is everything I expected it to be. Even though I don't watch a great amount of television the lower price allowed me to justify its purchase. Simply put, the Samsung 52A550 is an excellent TV. I have no worries about potential glare because this is in my basement. That said, this TV has the matte screen vice the glossier "Clear Panel" on the 650. After calibrating with DVE (not professional, but good enough for me at least), this set is a sight to behold. If you are seated too close (3-5 ft), you will see blurring during fast motion, but I highly doubt even 120Hz sets would rectify that at such a close distance. The set compared to my other HD LCDs, has a good SD picture but, as expected, HD is where it really shines. After thinking my FiOS connection looked great, I put in a Blu-Ray movie and was very impressed. Additionally, PS3 and Wii games and activities look great. I was a little more nervous about the Wii since it doesn't have HD output, but with the component cables (never tested the Composite), things look great. Upscaling DVDs don't look like blu-ray, but do look like HD. Haven't tested VHS tapes to date. For those who complain about the sound...if you are going to spend $1500 and up on a TV, whether it's Samsung, Sony, or any other manufacturer, just spend another $150-$200 on a basic surround sound system. Even the basic ones will perform well. I had an existing HT setup, so didn't worry about that. Yes, the TV speakers are tinny and weak and the SRS (virtual surround) doesn't really work unless you are in a closed off room (open floor plans, need not apply). You could argue that for the money, you should get premium sound...I just say the price of your set would increase by 25-50 percent, if not more. 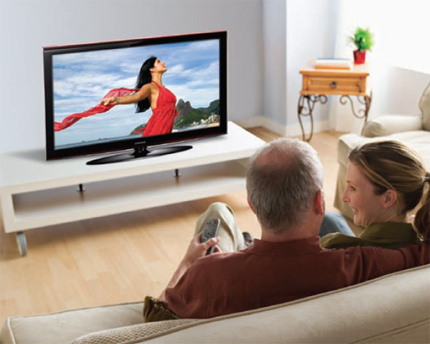 Outstanding sound in a small package is a challenge and these are TV manufacturers. You can't convince me that a different manufacturer suddenly has premium sound whether or not the speakers point out or down. Lastly, I was extremely nervous (but the price trumped that) about the delivery service. I was even more nervous when my email said I had Pilot and not CEVA. Obviously, I cannot speak for Pilot nationwide, but in the Philadelphia area they were excellent (the set was delivered to Delaware County just outside the city prior to them driving out to my place in Chester County). The day after I ordered, they called to set up an appointment and gave me an afternoon window. They showed up during the first half of that window a week after ordering. Yes, one of the guys looked like he was in a gang before he tried his hand at delivery, but I could care less about that than about the services rendered. They verified they had the correct address and carried the TV into the house and set it down. I wondered if that was it when the lead guy pulled out the paperwork from his back pocket, put it back in, and asked where I wanted the TV. I told him the basement and showed him where it was. No moans and groans about navigating the landing, he just told the other guy where they were going and moved it downstairs. After expecting due to all the negative reviews that the journey ended there (and being happy it was at least in the basement, they opened the box, lifted the TV up on my stand, connected the cables, turned it on, did the setup, and had me verify and initial the checklist they had (yes, no BS line about it's cold out, so warm up the TV first). When I ordered my TV, it didn't even have the banner on the Amazon page for White Glove Delivery, or Enhanced Delivery, just Free Delivery. All I cared about was getting the TV on the stand, but setting it up was a nice touch. I would have verified it worked anyway before they left, but again, nice that they did it for me. After a tip for each of the guys (without them waiting around looking like they were lost), they were on their way. No complaints with Pilot (understanding that they aren't the same everywhere).